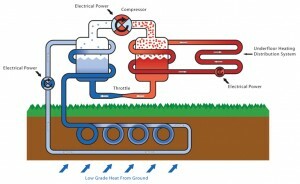 What are Ground Source Heat Pumps? Ground Source Heat Pumps are a renewable energy source which utilizes heat from the underground. This heat energy is then transferred from the ground to the premises where it can be used for hot water as well as heating. Why use us? Nialls is MCS accredited, which is a mark of quality and demonstrates compliance to industry standards. Its highlights to consumers that companies are able to consistently install or manufacture to the highest quality every time. How efficient is a Ground Source Heat Pump? Ground Source Heat Pumps are highly efficient as they are simply transferring energy rather than creating it. Ground Source Heat Pumps are becoming increasingly efficient, with some products on the market capable of producing 4KW of heat using just 1KW of electricity to power the pump. Making it 400% efficient (Co-efficient Of Performance, COP 4:1) However, the flow temperature of warm water achieved at the point of consumption is usually between 35-55⁰C. Higher temperatures can be obtained by working the pump harder but this compromises the COP. Therefore, heat pumps are brilliant for central heating especially in premises that are highly insulated and have underfloor heating. But, domestic hot water demand will require a back up. This back up will act as a top up, to the heat the ‘heat pump’ has already generated. 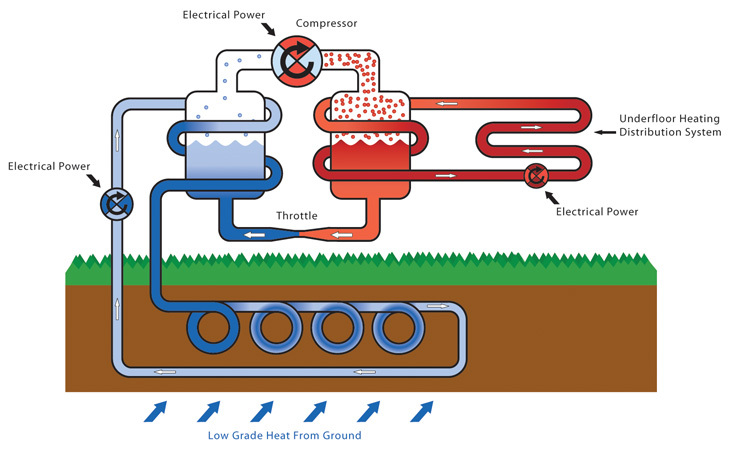 How does a Ground Source Heat Pump Work? A series of pipes known as the ground loop are laid in the ground. The ground loop can either be laid in trenches or in bore holes. The ground loop pipes are filled with a mixture of water and glycol (type of antifreeze). The soil surrounding the ground loop is of higher temperature (10⁰C – 13⁰C), which softly warms the glycol water mix as it is pumped through the ground loop. Stage 1 -The small required temperature increase of 3⁰C-4⁰C is carried through the ground loop to the heat exchanger/evaporator. The evaporator collects the heat from the heat loop liquid and returns it cool for the next cycle. This is done by boiling a refrigerant (-10⁰C) which turns to vapour. Stage 2 – The vapour produced in stage one is then forced into the compressor. The compressor acts as a catalyst by compressing the volume of the vapour. As the vapours volume reduces the temperature increases to temperatures between 75⁰C and 125⁰C. Stage 3 -This hot gas is then fed through a condenser which allows the refrigerant to turn back into a liquid. As the refrigerant condenses its heat is passed into the Heat exchanger. Stage 4 – Following the heat exchange the circuit is complete by an expansion valve, which reduces the pressure of the condense liquid. Vertical closed loop – The pipe simply runs vertically. A hole is bored vertically into the ground from anything between 25-150m deep. This is the more expensive option. Horizontal closed loop – Pipe run horizontally in ground at a depth of 1.5-2m. However, the depth is dependant on the soil type. This is the cheaper option but will require more space to fit the ground loop in the given area.